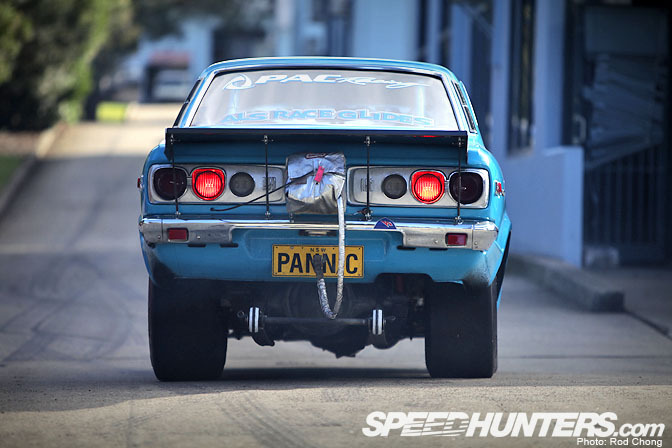 Brace yourselves, as you are about to enter into what can only be described as rotary heaven! 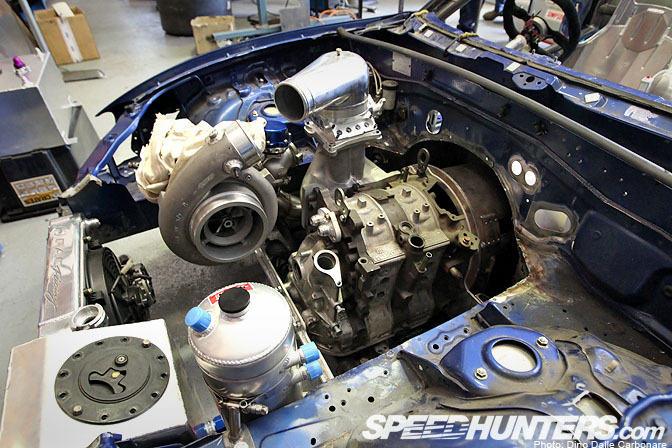 This is a place where tiny little Wankel engines are made to do incredible things when bolted down into equally impressive, purposely built chassis. 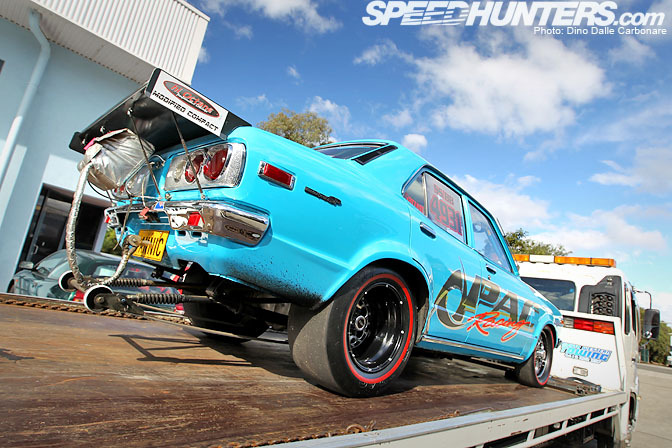 I am of course talking about PAC Performance, the next stop in our Australian drag racing shop tour. …as well as some of their race cars that have help make PAC what it is today. …as both he and his customers like to do things a little differently. 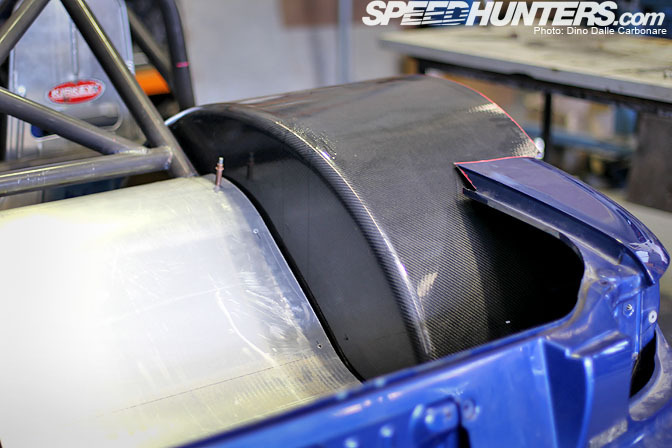 That is a fully tuned 20B under there! …but all that changes when you go around the back. 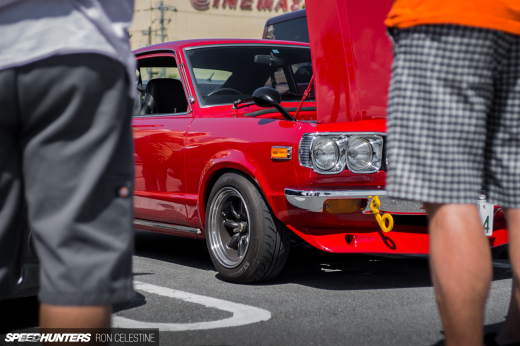 Fully tubbed rear wheel arches, wheelie bars, chute…the works! And what was going on here! This MX5 based customer project was something that really had me grinning; after all if you want to go fast down the strip you might as well use something small and light! 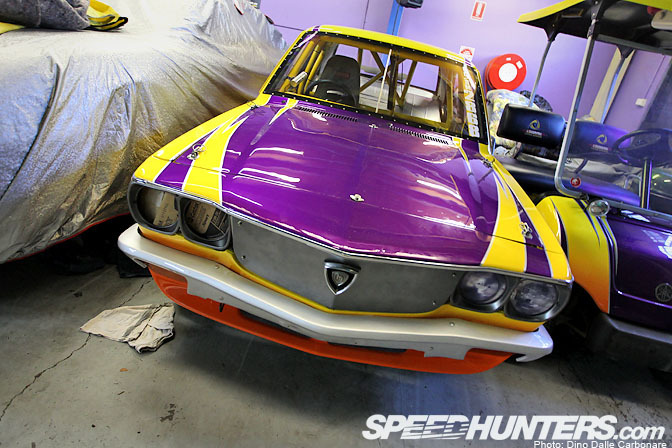 PAC may well build a lot of their projects on vintage or older Mazda models but they make heavy use of composite materials on a lot of their race cars. The carbon wheel arches on the MX5 are a good example. And of course it's 13B power all the way up front! 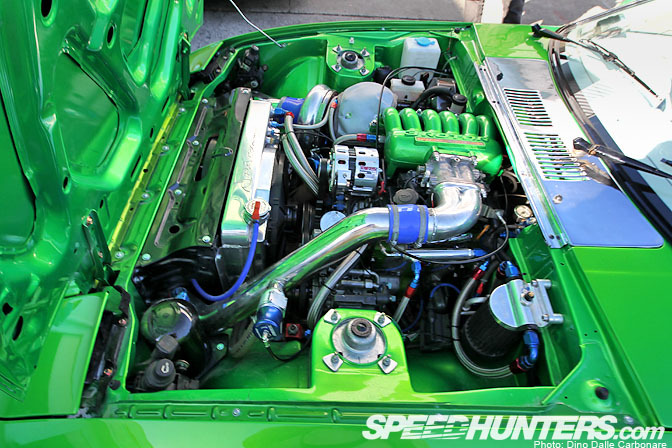 I thought the positioning of the massive blower was rather interesting, can't wait to see what the final engine bay will end up looking like. The car is being built for 7-sec passes. 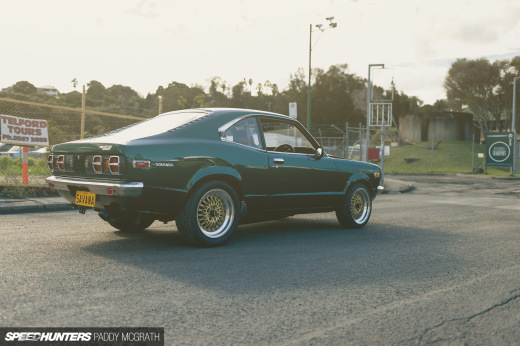 I think most the RX3s that Mazda made have all ended up downunder! PAC Performance is a family-run business, and this is Rocky's brother George assembling one of those massive rear drag wheels on the main shop floor. More 13B power for one of the latest builds PAC were in the middle of during the time of our visit. 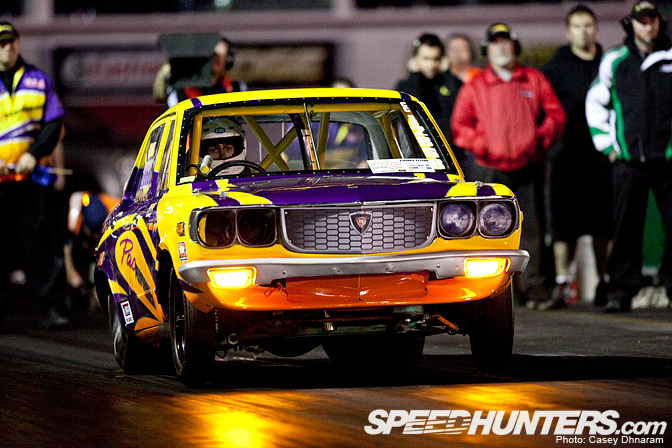 Now that is a proper drag stance! 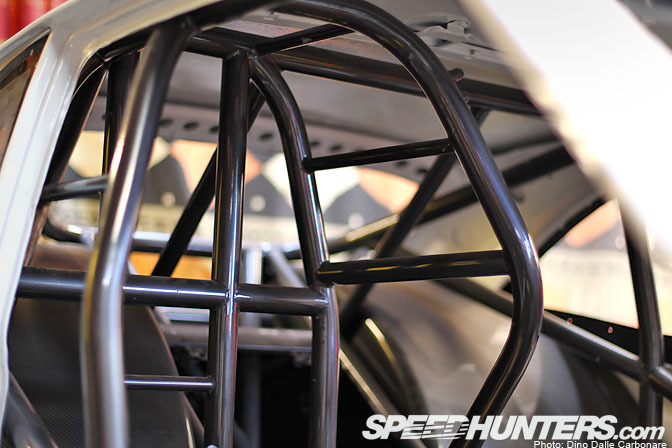 …some pretty intricate roll cages for their pro cars. The front wheels on a drag car don't have a lot of work to do so they can get away with running lightweight Weld Magnum billet wheels. 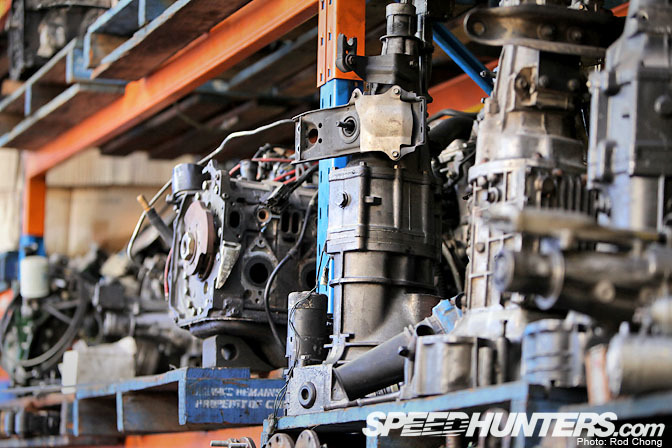 One side of the main workshop is stacked high with spare engines and gearboxes, parts that might come in handy one day. PAC has become know for the use of bright colors on some of their cars bright colors! 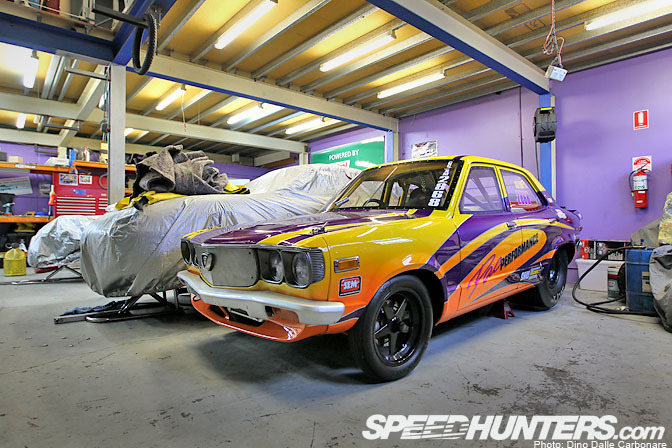 Parked outside we spotted yet another road registered RX3 drag car. Take a look at that stance! I wonder what Australian Police would think when spotting one of these beasts cruising down the street! Behind the drapes in the workshop we even spotted a JC Cosmo, a pretty rare car in Japan and an even rarer one in Australia. 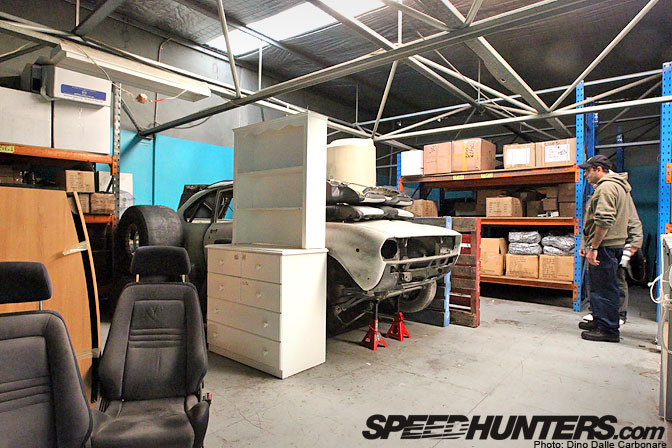 Rocky then took us into a closed off area of the workshops where the most special of PAC's cars are kept, just like this spotless RX3 SP. Here Rocky is showing Rod an RX2 he recently picked up and is hanging on to for future use. It's hard to come across original and well looked after chassis so whenever Rocky finds one he snaps it up. …drives at events like this year's Jamboree. 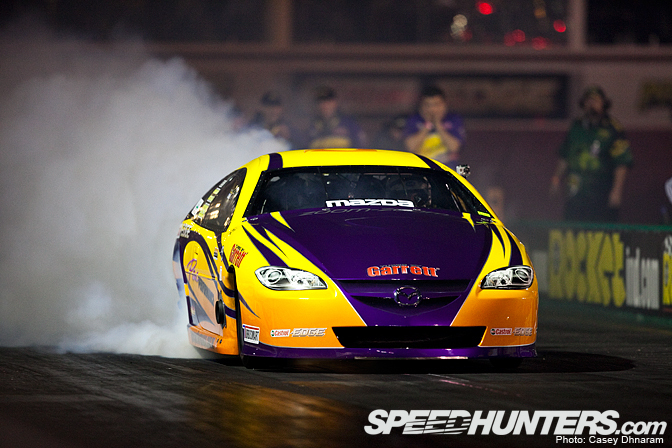 The car has managed a 7.28 sec pass at 187 mph making it the fastest back-half, 13B-powered car on the planet. When not in use this is where the car is kept. 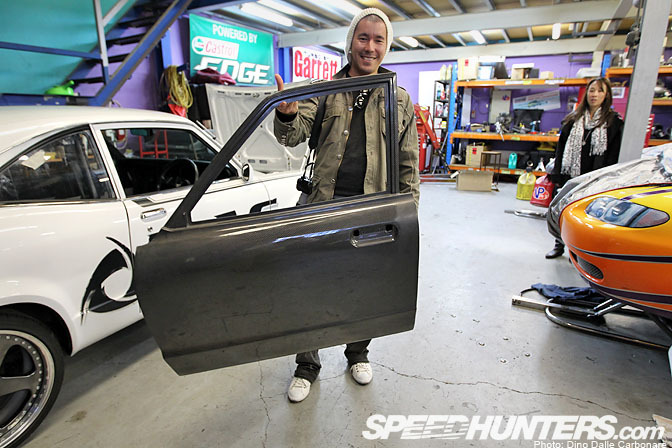 Here is Rod showing us just how light one of the carbon fiber doors that PAC makes is. Notice he is holding it with one finger! That is Karen, Rocky's wife, in the background, the person in charge of handling the PR and Marketing side of PAC Performance. 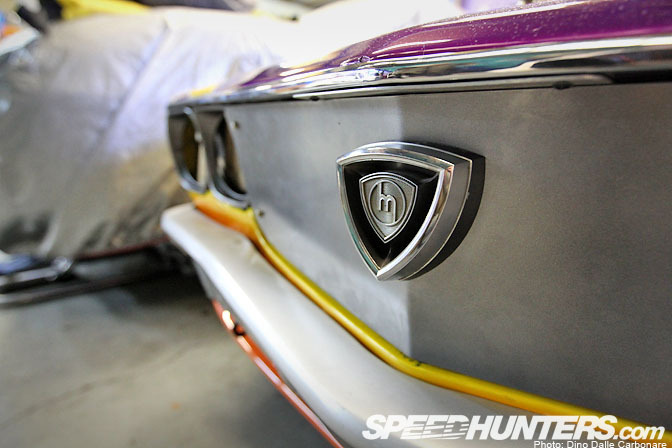 …which is the fastest rotary powered car in the world with a 6,708 sec @ 206 mph pass. Casey immortalized it in action for us at this year's Jamboree. 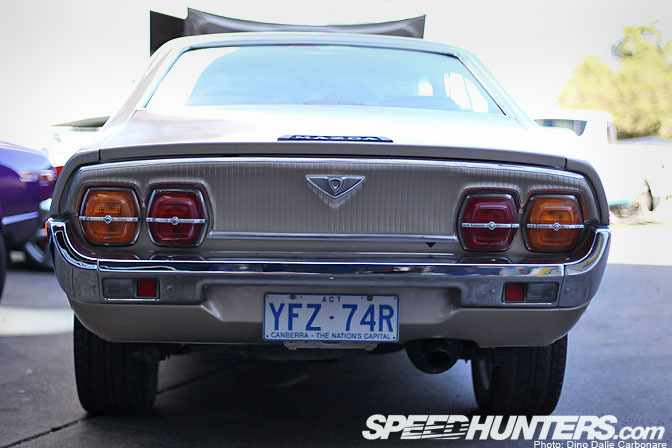 Here is a video of the record pass…just listen to that rotary scream! …when Rocky pulled up "Pannic" and whisked me off for a quick ride down to where I would be shooting it. Not a bad car to get a lift in! I would like to thank Rocky and Karen for their hospitality and for letting us shoot all around the workshops! Pac build crazy rotors. they've done so much for the sport compact scene over here. ive seen PANNIC cruising the streets in the middle of the day on a number of occasions with wheeliebars ard chute still bolted on, plus about 5 mufflers. 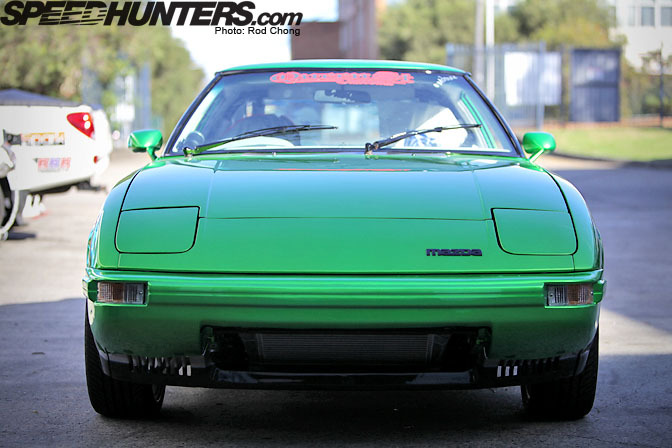 love that RX-7.. just the right colour!! 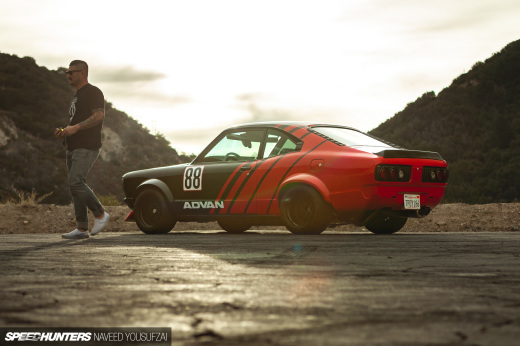 Coming from Puerto Rico I have a certain love for Rotary Engines... And this was just sweet !! Seeing the picture of the Cosmo takes me back to the early-90's when as an impressionable teenager I read an article in CAR magazine (back when it was Any Good) by the inimitable LJK Setright proclaiming the Cosmo to be the World's Best Car. 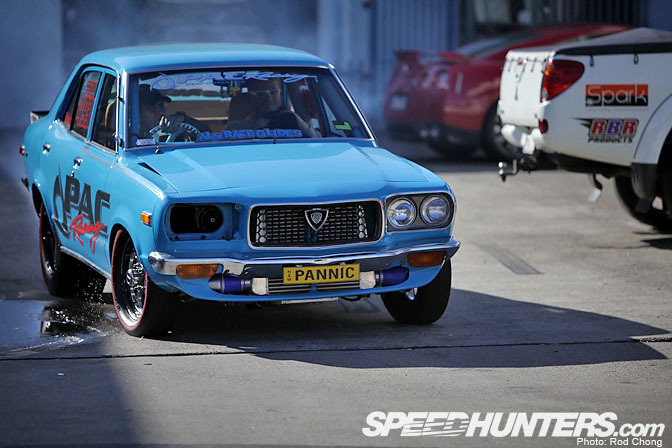 Loving the write-ups from the Australian tuners. Make sure you guys drop in to Pulse Racing - WRX and Evo heaven! 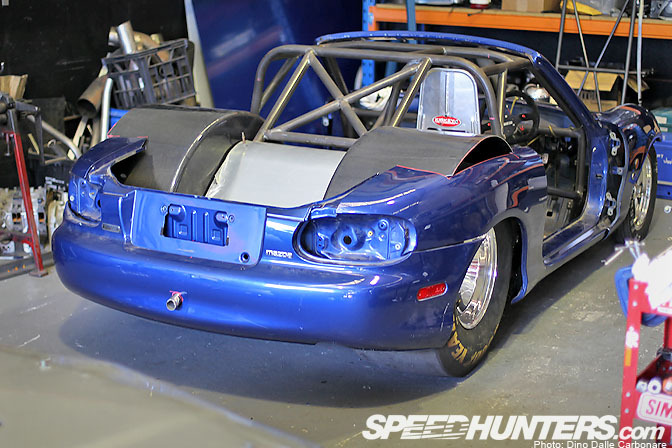 Awesome write up of an awesome shop, Do some 92+ Rx7 please! Nice Article and Awesome Pics!! Keep it up guys!! Either this is old or they haven heard the news, but the Record of the fastest Rotary powered cars belongs to Sammy Promotions back in Puerto Rico with a SAMMY PROMOTIONS 6.701 @ 205.93 MPH NEW WORLD RECORD. Love the rotary Faith these guys show!!!!! WAWAWEEWAA ILL NEVER SELL MY RX BLYADS!!!!! Um, a 6,708 sec. run? Did he push the car down the strip with the parking brake on? There's a huge difference between a comma and a period. Just a heads up.